Isagenix® has oils to suit everyone. Whether it’s a few drops of Lemon, Peppermint or Fresh™ to revitalise and refresh during the day or a hint of Lavender, Content™ or Tumbliss™ to relax and unwind for the evening, our Essence range is perfect for anyone, at any time! We know that you’re loving our oils so much that we’ve introduced a brand new, limited-edition scent in our 2018 Seasonal Catalogue! 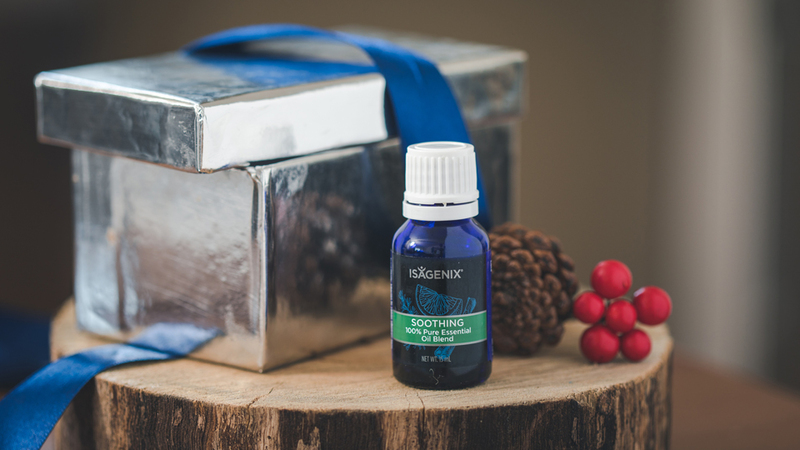 Soothing is specifically designed to raise the Christmas spirit in your household this holiday season! Soothing is a comforting and timeless aroma of orange, nutmeg and cinnamon that’ll transform your home into a sanctuary during this special time of the year. This sweet, warm and inviting essential oil is just one way Isagenix can help you tell your friends and family just how much you appreciate having them in your life. Alternatively, why not purchase it for yourself, so your guests feel welcomed and at ease when they visit you during this joyful (but sometimes slightly stressful!) time of year. There’s no need to complicate things during this glorious time of year. Essential oils are the honest and simple addition to your Christmas wish list. Be sure to check out the 2018 Seasonal Catalogue and head over to your Back Office or IsaLife™ app before 21 December and get the perfect gift for your loved ones this year!